A popular bunk bed set is being recalled after a three-year-old boy became entrapped in the frame and died due to asphyxiation. 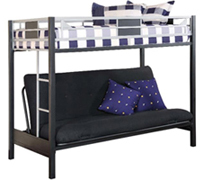 Big Lots of Columbus, Ohio is recalling 30,000 metal futon bunk beds sold at its stores nationwide from January 2009 through April 2010 for about $200. The recalled beds have a convertible futon bed on the bottom with a metal ladder leading up to a twin-sized bed. The Consumer Product Safety Commission (CPSC) warns parents that children behind the futon or in the ladder area can become entrapped when the futon and its metal frame are lowered to the flat position. In March 2010, a young boy from Burlington, Iowa suffered a wrongful death after his head and neck got caught in the bunk bed. The child was unable to breathe and died at the hospital due to compression asphyxiation. An additional hazard is the space between the last rung on the defective bunk bed’s ladder and the futon mattress is too small, posing a head and neck entrapment hazard. The Big Lots recall involves metal futon beds with model number BFB1008 located on a label on the upper bunk. The defective beds were sold unassembled and were manufactured in China. Consumers should immediately stop using the defective bunk beds. They can contact Big Lots for a free repair kit containing a new ladder and other parts. Consumers can contact Big Lots at (866) 244-5687 during business hours Monday through Friday or visit the retailer’s website at www.biglots.com. Big Lots has stores throughout Massachusetts, including in Lynn, West Bridgewater, Franklin, Milford, Methuen, Attleboro, Raynham Center, Worcester, Fitchburg, Seekonk, Swansea, Dudley, Gardner, Springfield and Northampton.